The prophet quoted here spoke to a weary and wary people, returning from two generations of exile to a homeland now occupied by other strangers. This reading is a practical lesson in manners at church, drawn not from conventional sources but from our faith. This narrative of a healing miracle invites us to consider how Jesus would have us hear and speak. Our Liturgical Setting: Today's gospel, Mark 7:31-37, is about hearing and speaking. On the surface, it's the story in which Jesus heals a deaf man who has a speech impediment. But symbolically it's about hearing the word of God and speaking it. It's all about that favorite Marcan theme, the messianic secret. That is Jesus' desire to keep folks from jumping to the premature conclusion that he is just a miracle-worker, before he can fulfill his mission in death and resurrection. The Historical Situation: The Jews are returning to their homeland after decades of exile in Babylon. Their arrival causes great friction with other tribes already there, especially the Edomites. (Sounds familiar, even in the 21st Century C.E., doesn't it?) A poetic prophet, steeped in the theology and language of the original Isaiah, tells the people what God is making of their return, and why they should be confident. 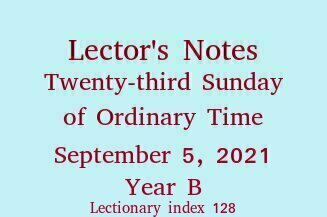 The passage is similar in spirit to Isaiah 40:1-5, 9-11, covered in Lector's Notes on last December's Second Sunday of Advent. Your Proclamation: How would the prophet have sounded? He spoke to a weary, wary people, but he had reason to be enthusiastic. He's reporting what he's been told to say by God. When you say God is coming "with vindication," remember what vindication meant for these people: liberation from alien captors who had mocked and subjugated them for two generations, return to the promised land. Vindication is more than a word. Pause after that sentence. Then predict the healings and natural wonders with amazement in your voice. Every word in the sentence about the lame is a single syllable; the sentence begs for a rapid, staccato pronunciation, with emphasis on "leap". In contrast with "burning sands," say "pools" with a soothing sound. This is poetry. Art is the marriage of content and form. Make it sound like what it means. Be sure you know the meaning and pronunciation of recompense and of steppe if they appear in your church's lectionary translation. The Background: In the very practical pastoral letter of James, (introduced in last week's Notes), these paragraphs make a simple point about how members of the church should treat others, whether the others are rich or poor. Your Proclamation: But the central sentence is anything but simple; it's sixty-seven words long. So study it carefully beforehand, deciding where to pause and where to switch between contrasting tones of voice. Your goal should be to paint, in the minds of the listening congregation, a picture of the offense described, and then pronounce James' judgment on that offense. Practice it before a family member or friend who is not armed with a missallette, until that person sees the picture clearly and understands why it's condemned. It will help your proclamation if you can recall suffering or witnessing the kind of discrimination that James is denouncing. Are you, or were you ever, a poor person humiliated by someone's favoritism toward others? Have you felt compassion for a specific person so treated? James wasn't writing speculative theology, but reacting to real hurts inflicted on real people, and calling real Christians to a higher level of charity and responsibility. If you have real memories of similar events, let them enrich your proclamation. The lectionary (the version for Catholics in the U.S., anyway), has a paragraph break after the long description of the ugly behavior. Pause there. Let your listeners answer in their hearts the accusation of James. Let the silence become uncomfortable. Then proceed with a change of tone. You're back to using logic again. "Didn't God choose the poor to give them faith and the kingdom?" You've made James' argument in a second, convincing way. 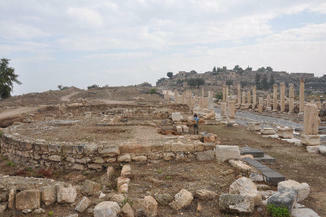 "Decapolis" means a region of ten cities. This is a photo of the baths at Gadara, one of the ten cities in the Decapolis mentioned in today's gospel. Click here for a larger version (includes information about the photographer and the sharing license). It's from the site Livius.org.